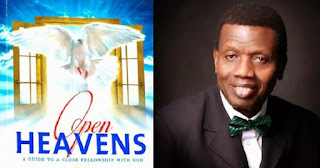 Open Heaven [28 April 2018] Lessons from the lepers - Open Heavens Daily Devotional Messages, By Pastor E.A Adeboye. The faith of the ten lepers in today’s Bible text can best be described as practical faith. They cried to Jesus for healing and He told them to go and show themselves to the priests to certify their cleansing. These lepers immediately proceeded as Jesus directed, even though the physical manifestation of their cleansing was not apparent. This s a classical demonstration of faith. Whether they came back to say “Thank you” to Jesus understand the practical faith demonstrated by these lepers, you need to read Leviticus chapter 14 which described the painstaking process of certifying the cleansing of lepers. Beloved, do you desire a miracle? You need to demonstrate the practical faith that exalts the Almighty God. The lepers in today’s story went ahead to show themselves to the priests because the Great Healer told them to do so. What is the Lord telling you to do so that you can have your financial breakthrough? Are you doing it? Are you paying your tithes and offering? Are honouring God with your first fruits and engaging in other forms of continuous giving (Luke 6:38)? The Bible also says that we should pray without ceasing because it is when we ask that we will demonstrate our faith in God who gave these instructions, and He honours our faith by doing what only He can do in our lives. There are many times the Almighty God would ask me to do things that are very ridiculous by doing the ridiculous, there is no way I can experience the miraculous which my knowledge of mathematics can never do for me. This is why I have been living a miraculous life daily, and it shall continue to be so till I see my Master in glory. My prayer is that the practical faith that you need to experience the miraculous will be given to you today in Jesus’ Name.